Wayne Allen | Daily Times Jeff Horsley is performing a diagnostic test on a truck he’s working. If there is one thing that can be said about Dean Knittel & Sons Auto Repair, located at 1201 Franklin Ave., in Portsmouth — they stay busy. J.D. Knittel said on Wednesday they were scheduled to work on 43 cars, which he said is the case on a nearly day-to-day basis. Knittel said the have eight mechanics that work at the business and they stay busy. 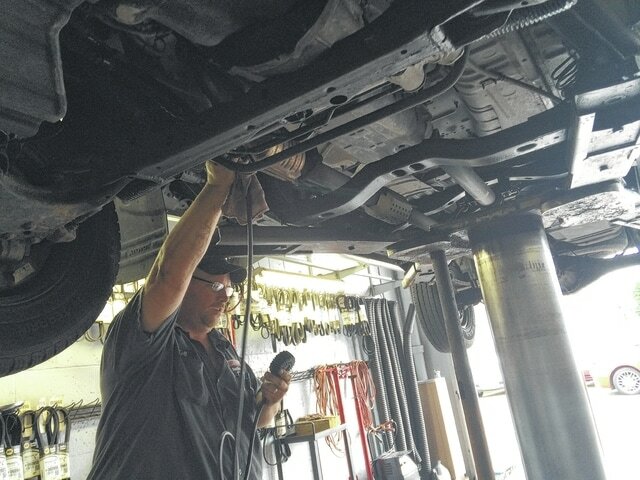 Knittel said they are able to provide a number of repairs to your vehicle, everything from changing the oil in your car, truck or SUV to any kind of electrical or computer work. He said the same level of activities rings true for every part of the business. “We do a lot of brake work. We can also do tune-ups and all of your general maintenance and some of the heavy duty stuff event,” Knittel said. Knittel said he is the third generation of his family to work at the business. “My grandpa started back in the (19)40s and we’ve been here since the early (19)60s,” Knittel said. Knittel said over the year they have been able to build a consumer base that returns, when they need something else fix or worked on. Knittel believes people keep coming back because of the service. Knittel said it’s a philosophy of the business to take care of the consumer first. He said there are two garage bays attached to the building, a five bay garage next to the building and another garage across the street. For more information about Dean Knittel & Sons Auto Repair call them at 740-353-1647.